Health: 64 Karma: 145 Resources: Fb(2), Am(50) on Namek Prime. Age: 5000+ Height: 9'. Weight: 450LBS. Talents: Martial Arts B, D, E (Namekian Psi-tokan), Leadership, Trance. Contacts: Nael(Son, Deceased), Z-Team (Rm(30) Resources, Hero Group), Dende (Son, Un(100) Resources, Guardian of Earth), Namek Prime(homeworld, destroyed). Growth - Atomic Gain: Permanent. Fb(2). Guruu is +1CS to hit. Power Control - Magnification: Mn(75). Contact range only. By making a Yellow Reason and Psyche FEAT, Guruu can increase a willing subject's abilities and Powers. He does this by unlocking the hidden potential in the subject's mind and body. The result is a pool of 75 points being evenly distributed among the subject's abilities and powers. Power Transferral: Mn(75). Transfer his ability to create dragonballs to any of his known offspring as well as any of his other powers. This transfer seems to be of a permanent nature. Mentally impart knowledge to a willing subject. Incarnation Awareness: Un(100). Guruu shares a telegenetic rapport with all Nameks of his lineage. A Namek's main weakness is his constant Psionic control of his body. If a Namek is being Mind Blasted, that Namek will find it very difficult to use his powers (this includes Regeneration, but not Armor Skin or Hyper-Hearing.). 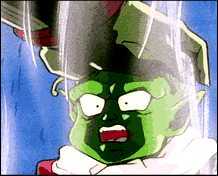 To regain control, a Namek must make a Psyche FEAT against the power rank used against him. If the Namek rolls a white then he cannot use his powers. A green result lets him use his powers at -4CS; yellow at -2CS; red regains full control and a +1CS to further attempts to resist the attacking power's rank. Note: Before his death on Earth, Guruu was the eldest of the Elder Nameks. He was also the only Elder Namek to survive the natural cataclysm that rendered much of Namek Prime inhospitable. Guruu was a Guardian Namek. He had the ability to create dragonballs. 2,000 Terran years ago, a war broke out on Planet Namek Prime. There were 2 factions in these wars---1) The Super Nameks 2) The Elder Nameks. The Super Nameks, led by Lord Slug's ancestor, were a group of Nameks who had the ability to assume a giant state. They believed that the Namek race should conquer the known universe. The Elder Nameks, led by Guruu and Kataat's ancestor and backed by the general populace of Namek Prime, believed in an isolationist policy. With the Elder Nameks victorious, many of the Super Nameks were banished from Namek Prime. Some of them even fled to Earth. In the time of Earth's European Middle Ages, another war between the Super & Elder Nameks broke out on Namek Prime. The Elder Nameks used their dragonballs to summon the entity known as Porunga. They then had Porunga use his powers to help them defeat the Super Nameks. Shortly after this, a comet collided with Namek Prime's atmosphere and rendered much of the planet's surface inhospitable. During his meditations, the now ancient Guruu, became aware of a great evil coming to his planet. This evil was the Planet Trade Guild. When the forces of the Planet Trade Guild invaded Namek Prime, Guruu chose to aid the Terran visitors in their efforts to find and collect the dragonballs before the Planet Trade Guild did. Before his old heart gave out, Guruu used the last of his power to unlock the hidden potential in Dende, Gohan, and Krillin. Within 1 hour later, the Eldest Namek died. His death would be revisited when he was wished back to life and sent to Earth. Knowing that his time was over, Guruu chose to become one with the universe. His body faded away as he said farewell to his people.